In these lessons, we will learn to distinguish between countable and uncountable nouns. We will also learn how to use the articles 'a', 'an' or 'the' for countable nouns. Most nouns are countable nouns, or count nouns. They are called countable nouns because they refer to people or things that can be counted. How to use the articles - a, an, the? 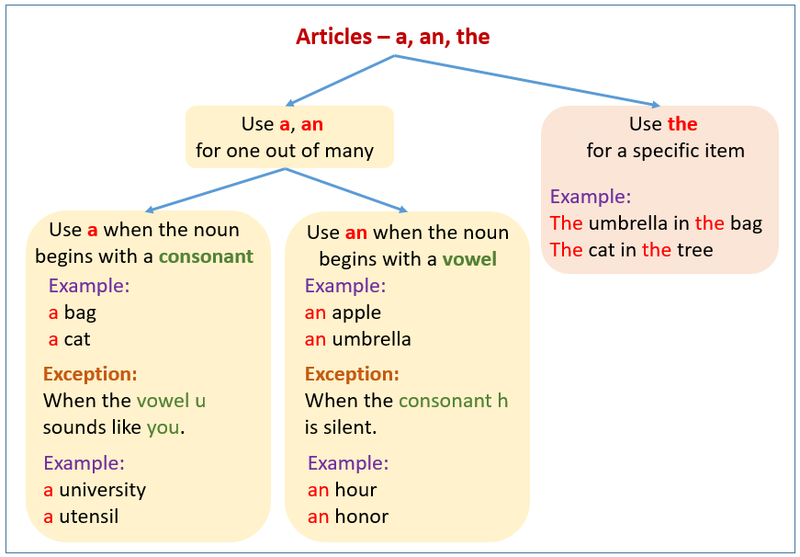 The following figure shows how to use the articles - a, an, the. . Scroll down the page for more examples and solutions. When you are talking about only one person, animal, place, or thing, you can put a or an before the noun. We put an before words beginning with vowels (a, e, i, o, u). But some words do not follow this rule. For example, some words that begins with the letter u, use a (not an). This occurs when the vowel u sounds like you. We put a before words beginning with the other letters of the alphabet called consonants (b, c, d, f, g, h, j, k, l, m, n, p, q, r, s, t, v, w, x, y, z). But some words do not follow this rule. For example, you put an (not a) before these words that begin with h. You would notice that h is not pronounced in these words. We put the before a countable noun when there is only one or when we are referring to a particular one. the earth The baby in the cot. the sky The radio in the room. the sun The tree in front of the house. We can use numbers or quantity words with countable nouns. Some nouns are called uncountable nouns or non-count nouns. They are called uncountable nouns because they are words for things we cannot count. We can put words like a piece of before uncountable nouns, and use them as countable nouns. We can use numbers and quantities with these words to show the plural form. This is a grammar lesson on countable and uncountable nouns. It describes the difference between nouns that we can count and those that are uncountable. It also demonstrates how we use the article "a/an" with countable and uncountable nouns. A furniture? Much books? Do you make mistakes like these? Learn some easy tricks to master countable and uncountable nouns for use in conversation and on exams. Countable nouns are individual items and so can be counted. They must have the indefinite article (a/an) for singular, or "s" for plural. Uncountable nouns refer to substances or ideas, and so cannot be counted. They can't take the indefinite article or "s"
Uncountable nouns always take a singular form and always use singular verbs. The articles used for countable nouns are a, an, and the. The articles used for uncountable nouns is the. Some quantifiers used for countable nouns are many, a few, a number of, a large number of, a majority of, several. Some quantifiers used for uncountable nouns are much, a little, a bit, a large amount of, a large quantity of, plenty of. Some quantifiers used for both are all, enough, some, any, a lot of. When do you use 'much' and when do you use 'many' and what is the difference. • Use with singular nouns. • Use to identify, classify, or define a noun. • Use to make a general reference. • Use A before a singular noun that starts with a consonant sound. • Use AN before a singular noun that starts with a vowel sound. A and AN are definite articles. We often use them before a singular noun the first time we mention it. THE is the definite article. We use it before a singular noun after the first mention. THE makes a noun specific - it is known and understood by the speaker and listener. • Use THE even in the first mention of singular noun if the particular thing or person is known or understood by both the speaker and listener. • A proper noun is the name of a particular person, place, or thing. A proper noun begins with a capital letter. • The zero article is often used before proper nouns. This video gives a brief introduction to count and non-count nouns. ESL learners must master this before they can properly use articles and modifiers with nouns. Count nouns are the names of "things" that can be counted, such as apples. Non-count nouns are the names of "things" which cannot be counted, such as water. • use quantity words or quantifiers (e.g. much or many) correctly. Check a dictionary if you are not sure whether a noun is countable or uncountable.